Sometimes you just need something savoury to crunch away at. Chips are usually what we all turn to for that crunchy, salty, savoury craving cure. But, chips come with saturated fat, usually too much salt, and sometimes some pretty bad additives. Your body doesn’t thank you after downing a whole bag of chippies. These little morsels, on the other hand, will cure that craving, and your body will sing hallelujah! 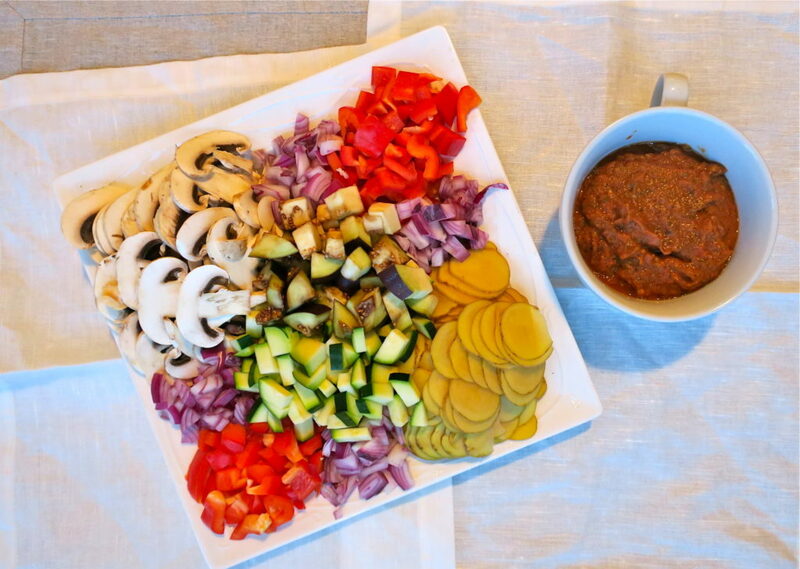 Oil-free, cholesterol-free, nutrient-dense and delicious! A perfect road tripping snack too. I’ll be making a couple batches of these for my trip to Sin City this week. Las Vegas Baby! I’ve never been. We aren’t the type to vacation to cities… we usually are the ones planning adventure mountain bike, paddle board or tropical trips. But it’s been raining, there were cheap tickets, and there’s a first time for everything! 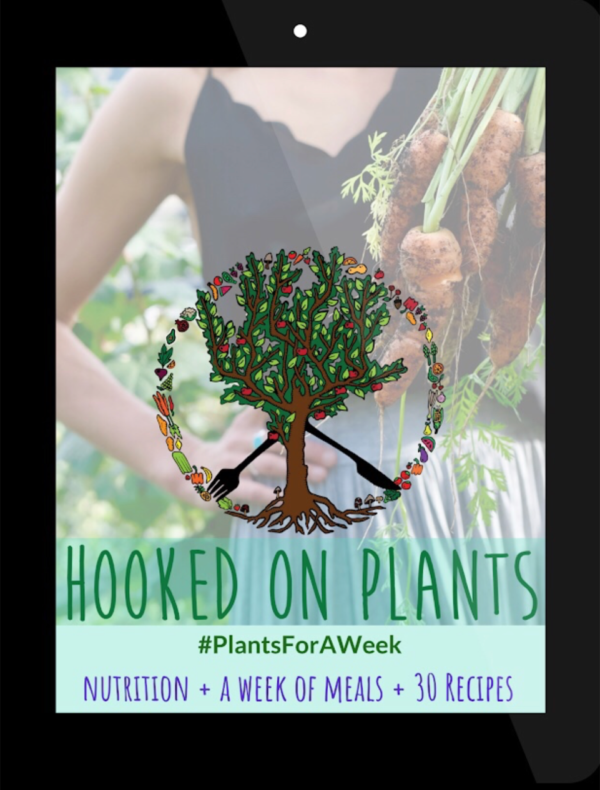 I’ll let you know about it when I return… Or follow @juliamurrayski on Instagram for updates, and @hookedonplants for the vegan eats I find. Just a few days of hot weather and good people watching before the winter season. Why not right? Do you have any Vegas recommendations for me??? OK, back to the crispy snacks. 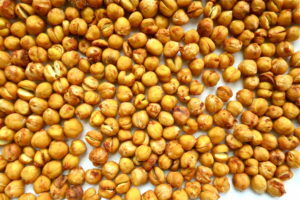 Chickpeas have been used to treat high blood pressure, lower cholesterol, and pack that easily digestible plant-protein. Adding these or other legumes and beans to your diet with help you live longer with more energy! Himalayan salt is the most pure salt you can use and is packed with minerals and vitamins (it even trumps sea salt, which also may have trace chemicals depending on the water source). Table salt, on the other hand, is stripped of it’s minerals and vitamins to a substance that is 95% sodium chloride and synthetic chemicals that will lead to high blood pressure, kidney damage, water retention and a whole lot more. 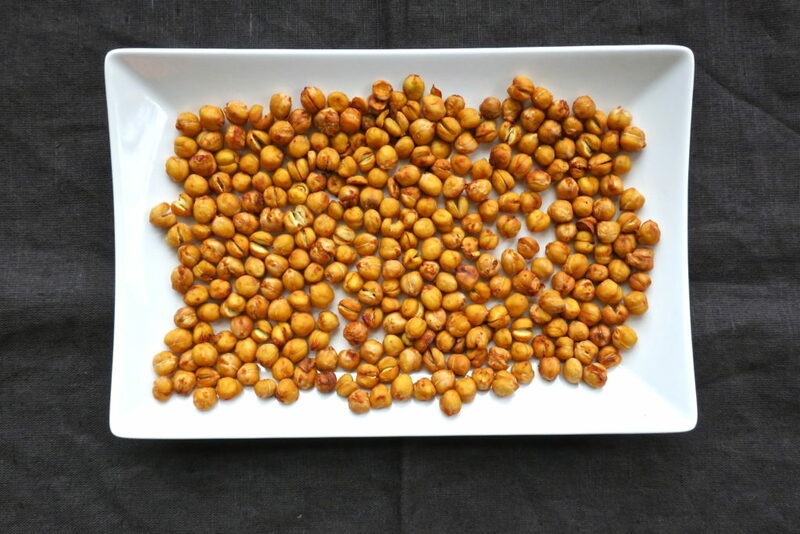 Pat down chickpeas with paper towel or tea towel until most of their moisture is off. Roast for 30-45 minutes (until crunchy), taking them out to shake around every 10 minutes. Watch close near the end so they don’t burn! 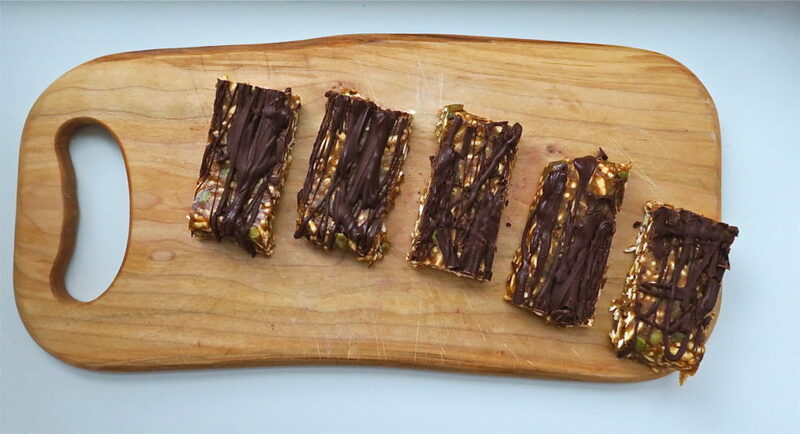 Simple, no-bake, mouthwatering, chocolate-y, fudge-y dessert bars. Totally a go-to for any day of the week. 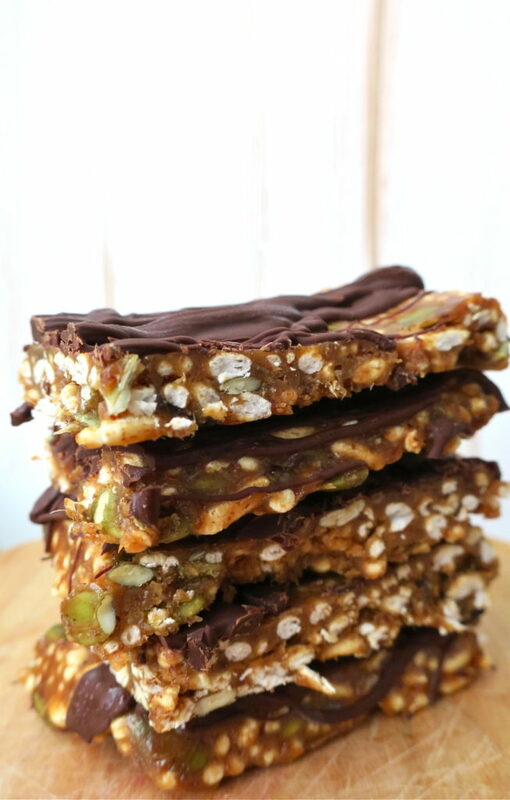 This recipe is adapted from on of my favourite food bloggers, Dana at the Minimalist Baker. 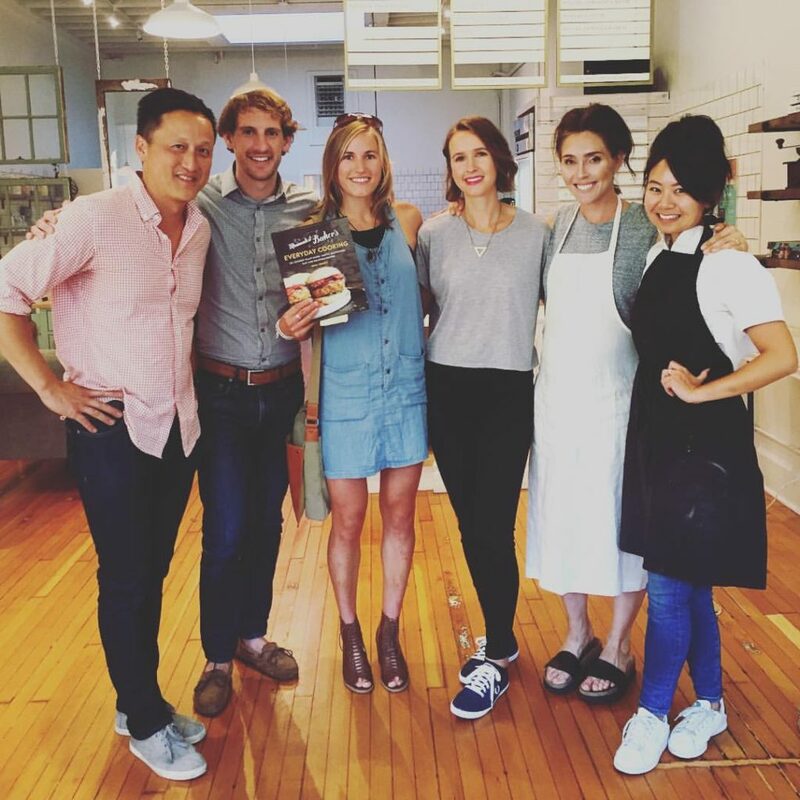 I was lucky enough to grab a signed copy of Dana’s book at her book signing at Nourish Cafe after her and the lovely Erin Ireland‘s cooking demo! 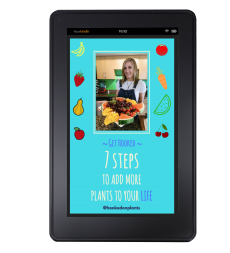 It’s an amazing new cookbook, Everyday Cooking. Every single recipe is simple and drool-worthy. She and her husband, John are both over-the-top inspiring. 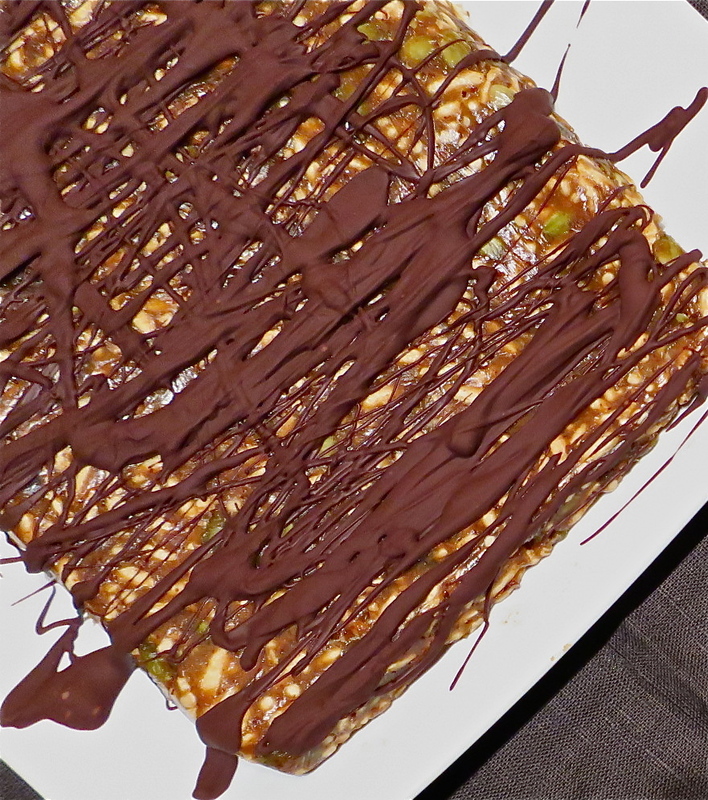 These bars are perfectly scrumptious snacks or desserts. Just sink your teeth into them once. I used quinoa puffs as well as rice puffs, pumpkin seeds instead of sunflower seeds, maple syrup instead of agave syrup, and a mixture of sunflower seed butter and almond butter instead of peanut butter. –Quinoa, AKA the mother grain, contains all 9 essential amino acids that our bodies can’t produce themselves. 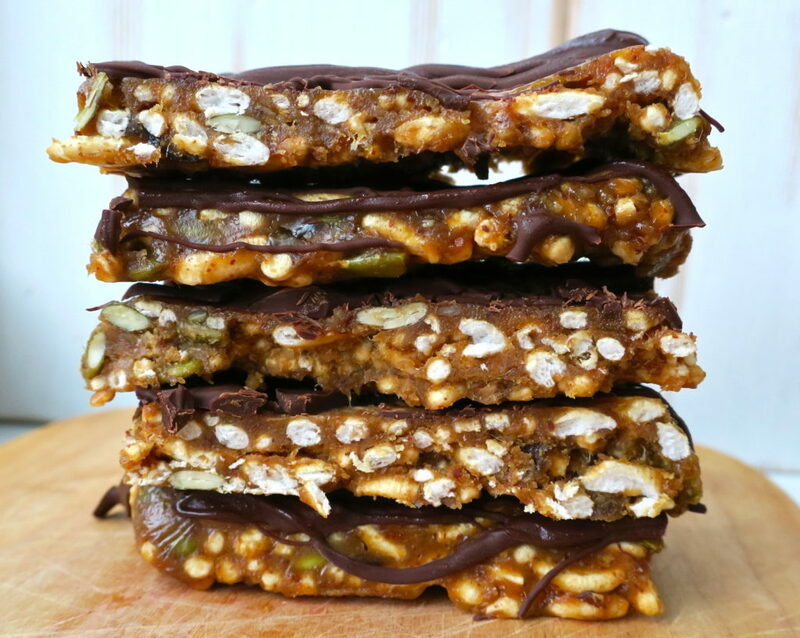 So these bars are packed with plant-powered protein and nutrient-dense energy. –Maple syrup is one of the least processed liquid sweeteners you can use. It’s packed with antioxidants and has a low glycemic index compared to most other sweeteners. This means you avoid the sugar spike, and inevitable crash like you would get from more refined sugars. And it’s Canadian, yo! Prepare about a 6″x 8″ cake pan by spreading parchment paper or plastic wrap on bottom and over edges. Add almond butter, PB2 paste and maple syrup to a small pot. Heat on low heat and stir until mixture is smooth. Add almond butter mixture to a bowl with chopped dates. Stir to combine. Add quinoa, rice puffs and pumpkin seeds. Mix with wooden spoon until evenly combined. Spread out mixture in the prepared pan. To flatten evenly, use parchment paper between your hands and the mixture and press down firmly. 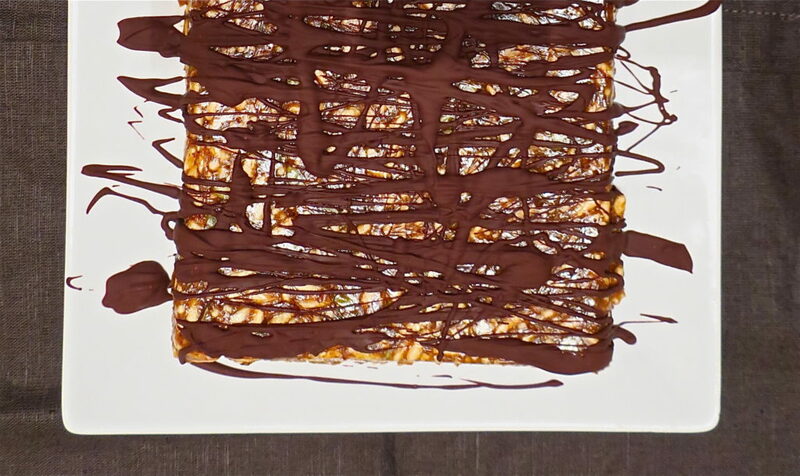 Remove the top parchment paper, and place pan in the freezer to set for 10 minutes. While the deliciousness is freezing, prepare your chocolate sauce. Melt chocolate chips in a double boiler on the stove, or in 30 second increments in a bowl in the microwave (stirring each time), until you have a smooth sauce. 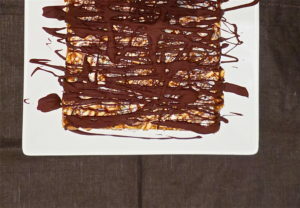 Take the bars out of the freezer, and drizzle chocolate sauce over with a fork. Throw that pan of goodness back into the freezer and wait (the hardest part) for 10 minutes until it is set. Cut into shapes of your choice and gobble up. 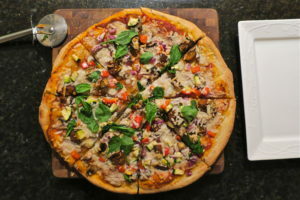 Going plant-based doesn’t mean you have to miss out on pizza parties. No way. You can make that pizza and eat it too. 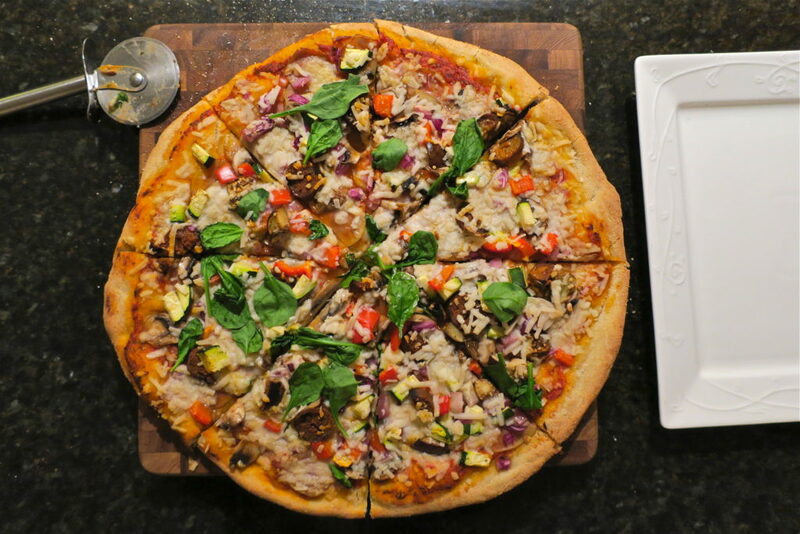 Vegan pizza can be just as delish, yet way more nourishing than your usual suspects on the pizzeria menu. Homemade roasted tomato sauce, thinly sliced potatoes, a truck load of veggies, and you’re on your way to a pizza party packed with pizzaz. There will be more than enough satisfying tastes and textures so that you can call it comfort food. The thinly sliced potatoes first up on the layering order, give the pizza a decadent texture when you bite into it. These spuds laying on top of the italian roasted, roma tomato pizza sauce will sky-rocket your taste buds to pizza heaven. I like mine without the vegan cheese, but Davey still doesn’t get how pizza can be pizza without some kind of cheese 😉 I’m sure lots of you are in the same boat. So, we used Follow Your Heart mozzarella shreds for his, and a healthy sprinkle of nutritional yeast for mine. -Roasting tomatoes actually increases the availability of their phytochemicals. 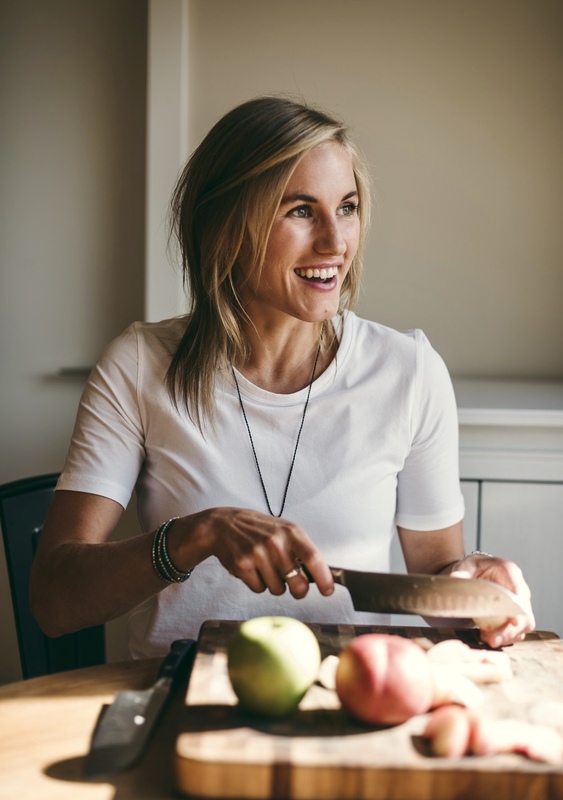 Eating plants in their raw form is usually the way to make sure you receive all the nutrients they are carrying, but tomatoes are one of the very few that actually become more beneficial to your body when you cook them. –Red Peppers bring you some of the highest amounts of vitamin C (for immunity), vitamin A (for eye health), antioxidants, and folate (to help prevent anemia). Green peppers are actually just unripe red peppers with half the vitamin C, and a bitter taste! Go for the most colourful red option. 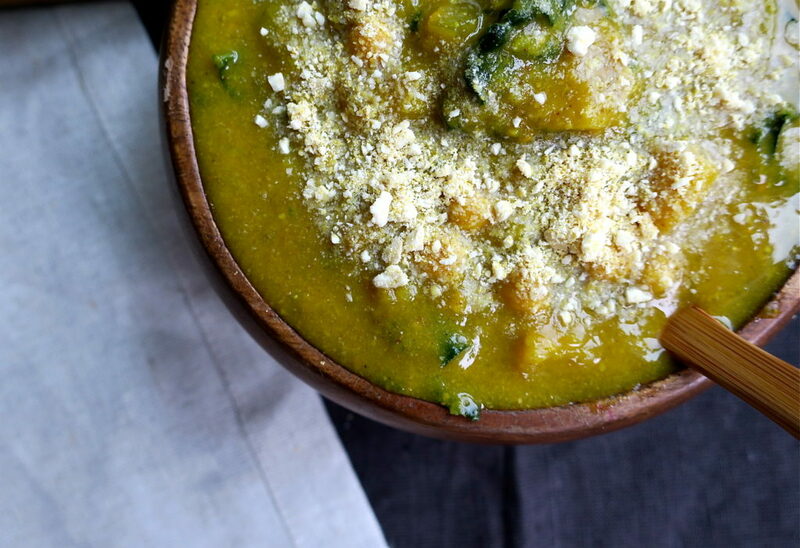 –Nutritional yeast (I wish there was a better name for this!) is packed with B Vitamins! B vitamins are vital for your nervous system and energy. It’s also antiviral, anti-bacterial and immune-boosting. Plus it’s a great source of protein and B12 (great for vegans). Make tomato sauce: Preheat oven to 425 degrees F, slice roma tomatoes length-wise and place cut-side up, single layered on parchment paper covered pan and sprinkle with salt. Roast for 25 minutes (you will see caramelization in action). Blend tomatoes in high speed blender with spices until smooth. 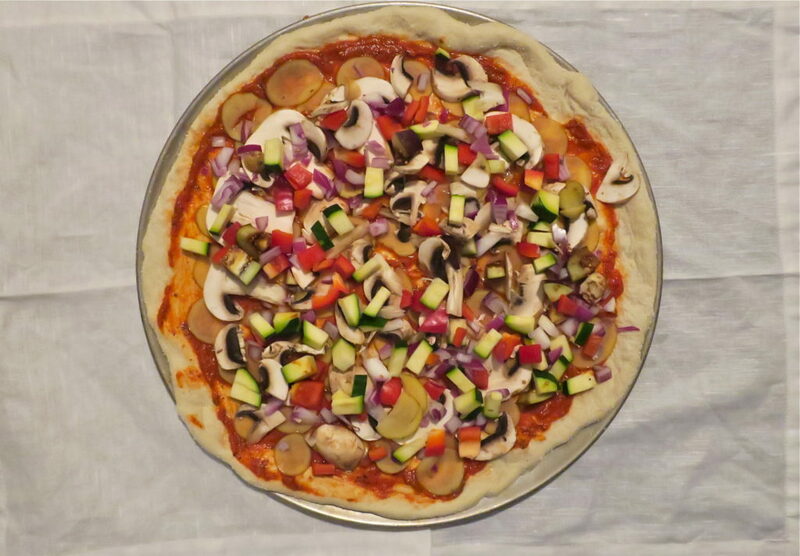 Lightly oil pizza pans with coconut oil, or just use parchment paper. I often use my cookie sheets, and make square pizzas. Sprinkle coconut flour (this is gluten free, but you can use any flour) on clean counter and roll out pizza dough as best you can! I’m no expert here. Spread dough onto pan. Cover with pizza sauce. Layer the thinly sliced potatoes all over the pizza. 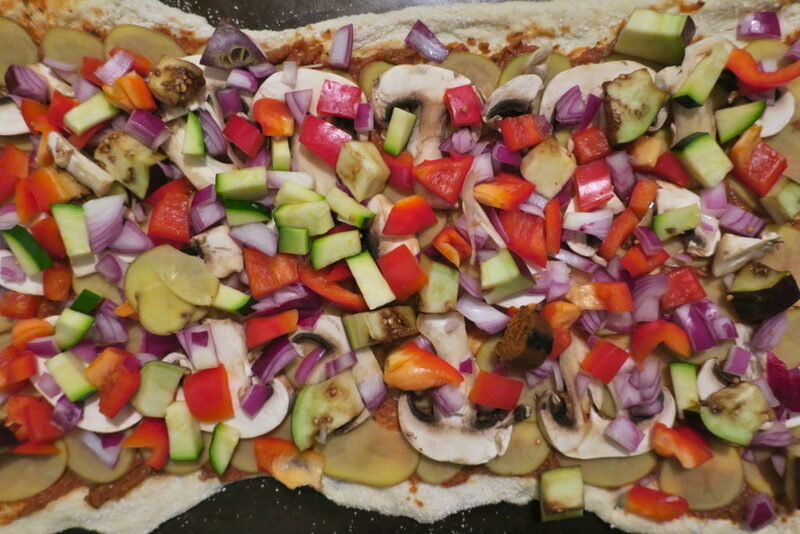 Layer the rest of vegetables on the pizza. Sprinkle with cheese (or don’t). Bake in 425F oven on the middle rack for 18-20 minutes, or until golden brown crust. With one minute remaining, sprinkle the spinach across your pizza. Sprinkle on nutritional yeast when served. Stew, Soup and Chili ~ 3 of the many reasons I love Fall. 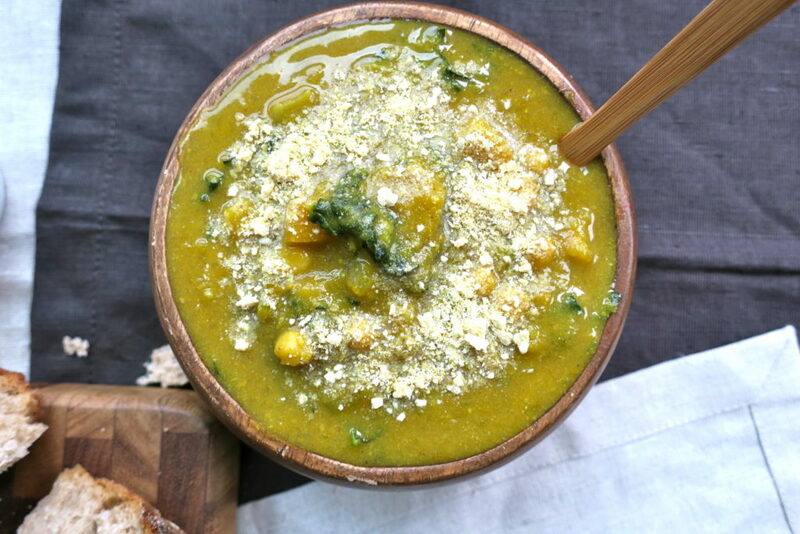 Add in some torn rustic bread plus cashew ‘parmesan’, and you have yourself Fall in food-form. 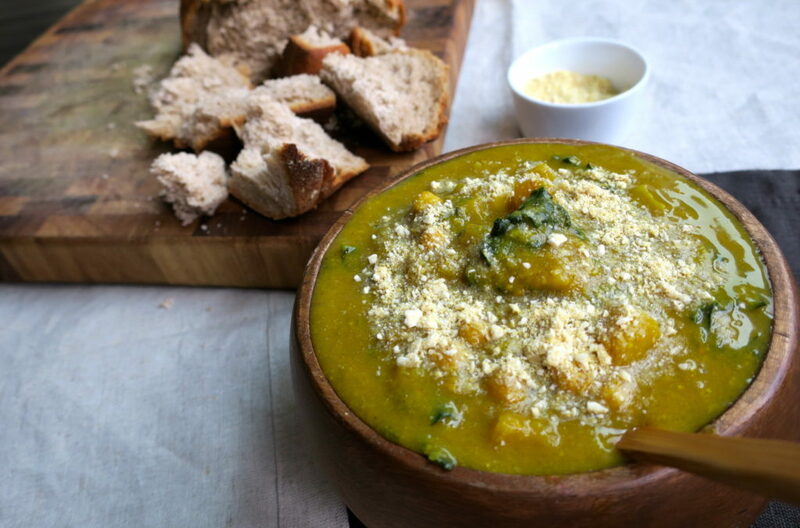 This stew features my favourite squash. Butternut. Just saying the name makes me drool. This week has been all about moving house. So cooking up a batch of this comforting, nourishing, warming pot of goodness that will last for a week was much needed. Who has time to cook every night when you’ve got walls to paint, boxes to unpack, bed frames to build, lights to put in, house tours to do and clothes to get rid of? 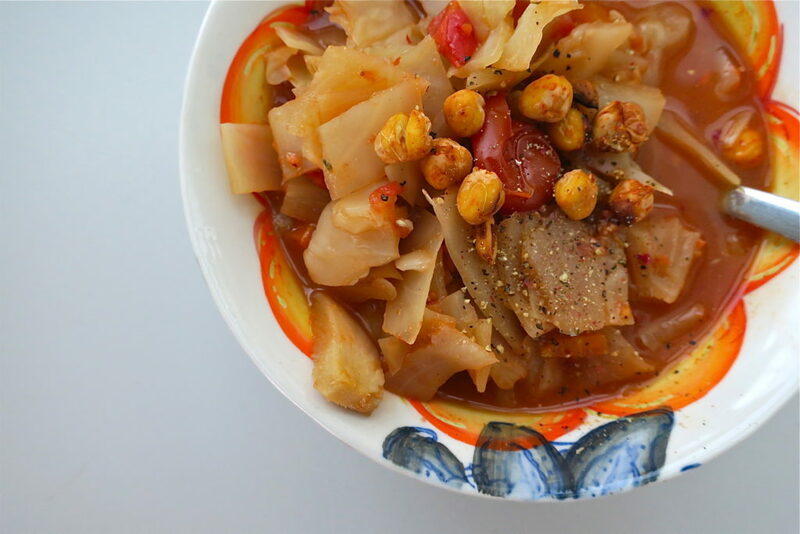 So yes, this stew is perfect for a busy week. And be prepared to have a kitchen that smells better than your mom’s cookin’. You could make a big batch and have a dinner party, or keep it for yourself as left overs in the fridge. The flavours will become better buds by the day as they chill together in the fridge. The one, two, three, fours of cutting up your butternut squash. Cut, empty, peel, chop. Butternut Squash is low in fat and high in fibre. This is the perfect combination for longevity and heart health. 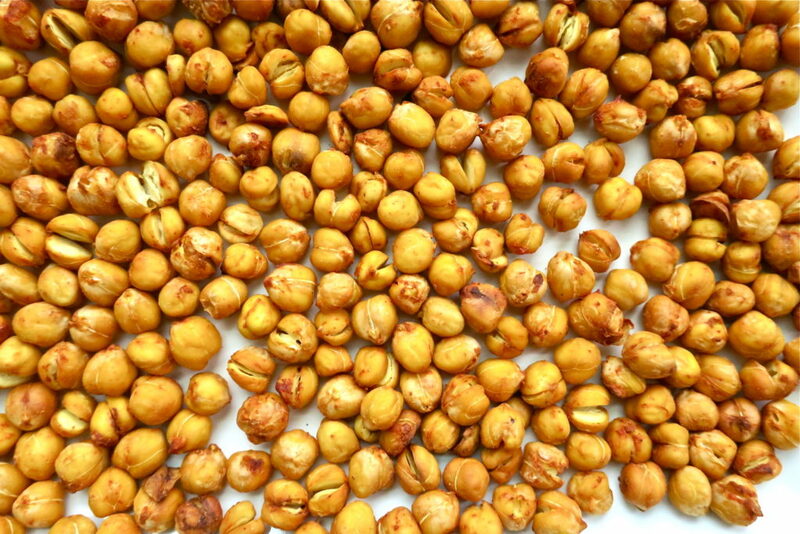 It’s also packed with potassium (bone health), and vitamin B6 (nervous system functioning). Now is the time to eat squash and pumpkins! Eating local and seasonal is the most nutrient-dense way to go. Turmeric is incredibly anti-inflammatory. Inflammation is the precursor of disease, so keep this at bay by eating your turmeric! It’s also known to help depression and ward off cancer. 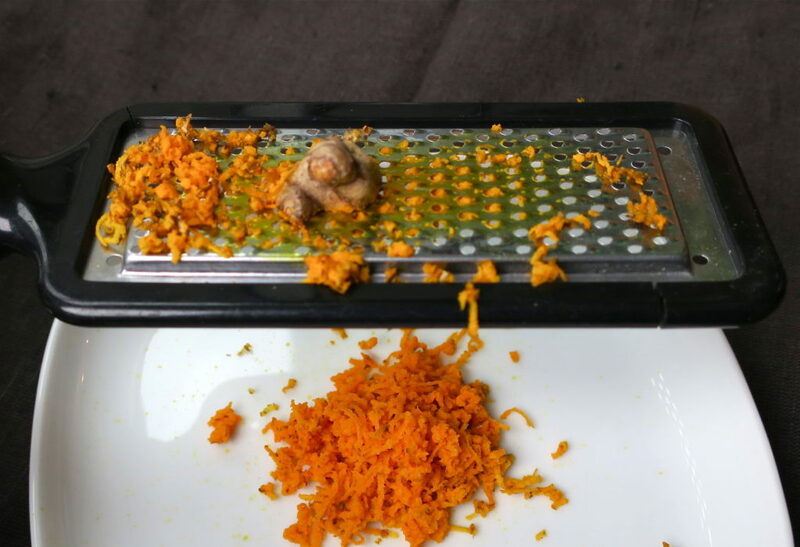 It’s bright orange colour is packed with vitamin C. If you can get your hands on the turmeric root, do it! Fresh is best. Make sure you add in the pepper to help your body absorb the turmeric and experience all of the amazing benefits of this little orange root. 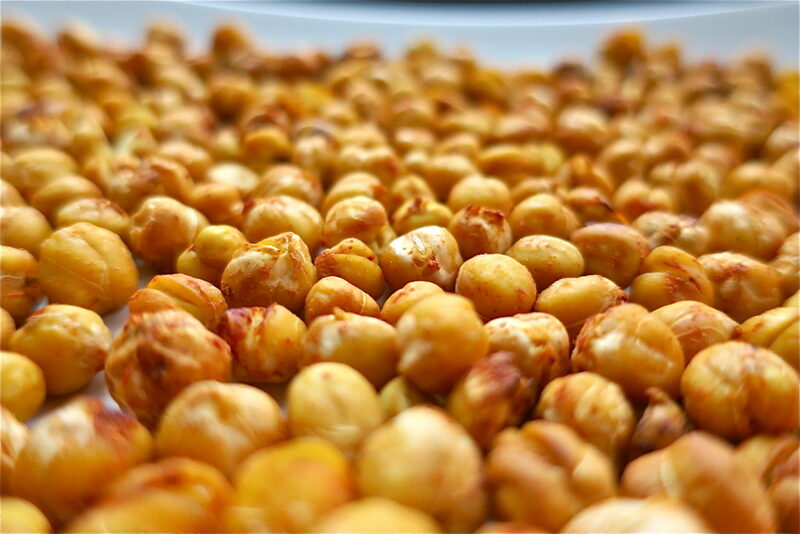 Chickpeas like all legumes and beans are packed with easily-digestible plant protein, low in fat, and high in complex carbs. They’ve got antioxidants like selenium to enhance the immune system and they’re high in manganese, magnesium, vitamin K, and calcium to help with bone health. Sweat the onions, carrot and celery with a splash of water in a deep pot for a few minutes (until onions are translucent). Add in garlic, spices, salt and turmeric. Saute for 2-3 minutes. Add in butternut squash, stir for a minute to coat. Pour in vegetable broth and coconut milk, then bring to a boil. 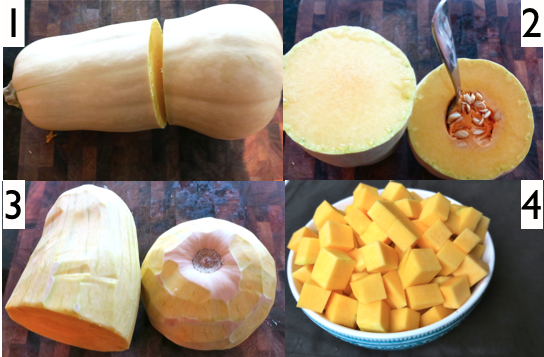 Stir, then simmer for 15 minutes, or until you can poke through the squash with a fork. Make cashew parmesan while you wait. Blend all ingredients together in food processor (mini processor is best) or high-speed blender until a parmesan consistency is achieved. If it gets stuck at the bottom of your machine, just double the recipe! You can store in a fridge for a few weeks. Ladle half of the stew into a blender and blend until smooth. Pour blended stew back into pot, then add chickpeas and kale. Let simmer another 2 minutes, et voila! 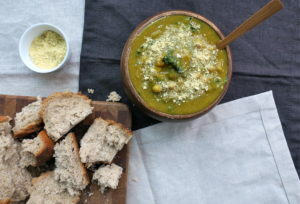 Serve in your favourite bowl with warm bread on the side and cashew parmesan on top. Sometimes all you need is something warm to put your hands around. And right now, that something calls for some pumpkin spice and bananas. 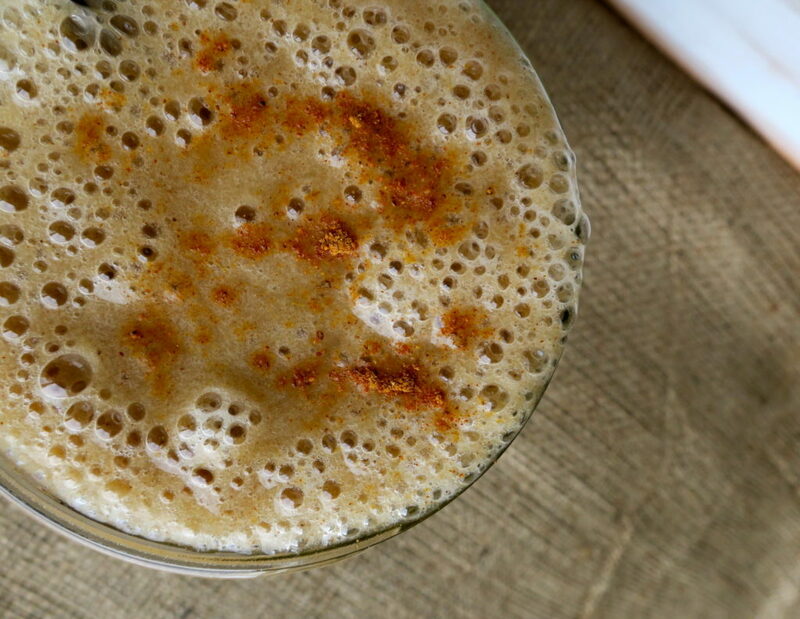 With just 3 ingredients and a blender, you will have a mylkshake (without the milk) that will knock your thick socks off, taste like pumpkin pie heaven, and allow your eyes to roll in all the mmmmm-ness. Fall is definitely upon us, and this comforting bevy will be the cherry on top of your cozy sweatpants, a good vegan documentary and those over-worn slippers from your amazing grandma … or is that just me? With Thanksgiving (in Canada) done, it doesn’t mean the festivities can’t continue. Keep those pumpkin recipes coming, am I right?! Tis’ the season. 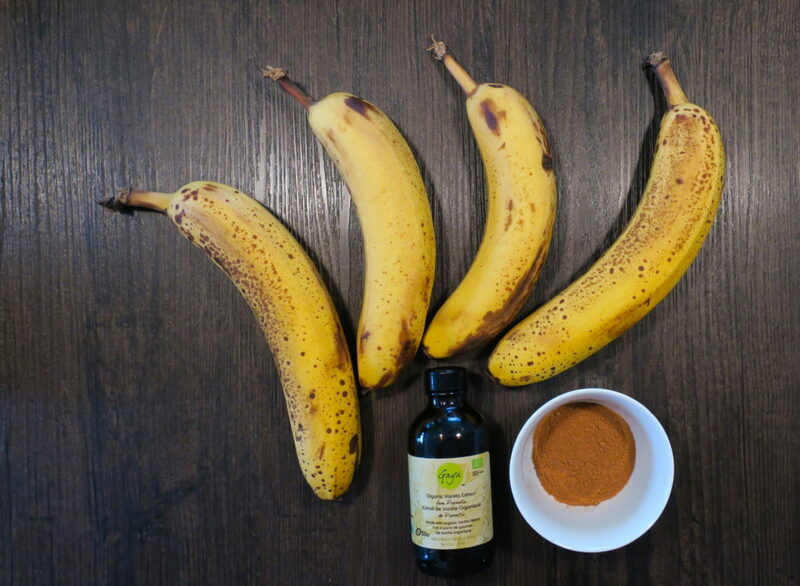 Bananas should enjoyed be in their ripe form (with spots). They’re amazing for digestion, high in potassium and rich in fibre. 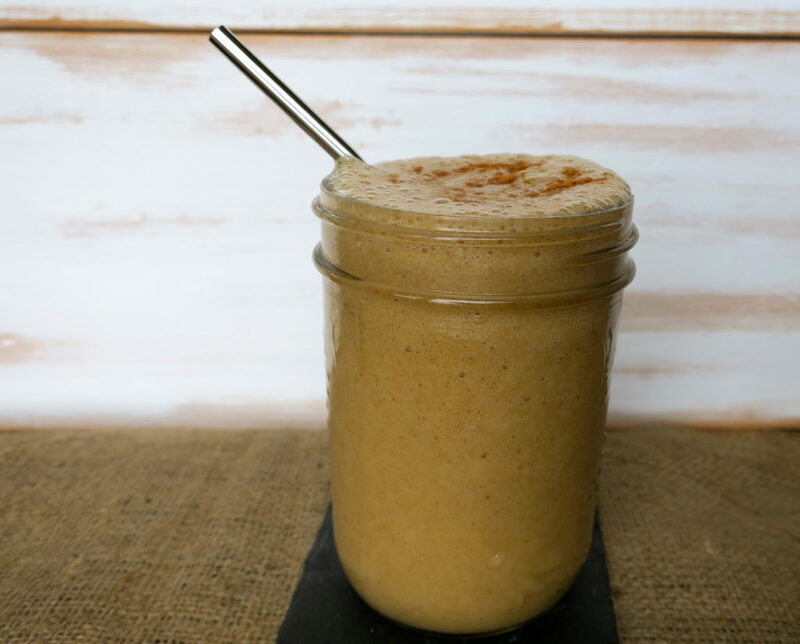 Pumpkin Pie Spice contains cinnamon and ginger which both have great benefits for your bod. 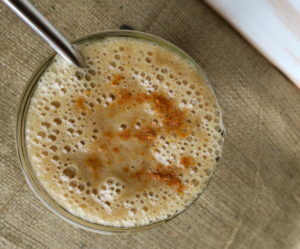 Ginger is a well-known immune-booster, and cinnamon is the king of lowering blood-sugar levels. Vanilla (the pure extract) actually is anti-inflammatory, which helps you fight nasty diseases, and allows your body to function optimally. Pour into your favourite mug, and enjoy. There is no step three.. you’re done! That’s it! Now go enjoy your bevy!